Seashells and pom poms for spring and summer! 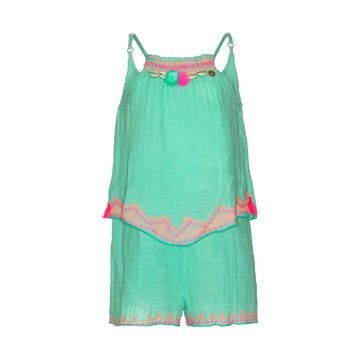 This adorable mint green one piece romper is absolutely precious by Mim Pi. This designer brand always astonishes us with its use of unique and fun embellishments to set themselves apart in the ever-changing fashion world. 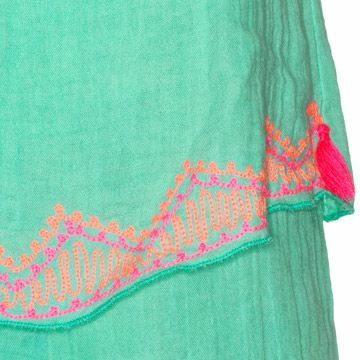 The romper is made of the softest cotton light and breezy voile fabric. The bodice is trimmed with embellishments, smocking and sweet shoulder ties. One piece romper that looks like a two piece. Shipping now this adorable spring short jumpsuit. Available in sizes 7, 8, 10 & 12.